To honor the fiftieth anniversary of the Second Vatican Council and the twentieth anniversary of the Catechism of the Catholic Church, Pope Benedict XVI has announced a Year of Faith, starting October 11 and ending November 24, 2013, to strengthen the faith of Catholics and draw the world to faith by their example. 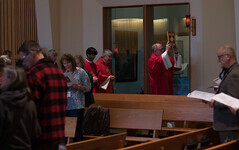 The Year of Faith is meant to reflect one of the themes of Pope Benedict’s pontificate, the New Evangelization. It’s not new in content, but new in energy and approach. The New Evangelization re-proposes the faith to a world longing for answers to life’s most profound questions. It’s a call to share Christ and bring the Gospel, with renewed energy and through ever-changing methods, to new and different audiences. It begins with personal conversion. The New Evangelization begins internally and spreads outward. We are called to deepen our own faith in order to better share it with others. Then-Cardinal Joseph Ratzinger described this in the Jubilee Year 2000 as daring to have faith with the humility of the mustard seed that leaves up to God how and when the tree will grow. Conversion to Christ is the first step. It’s for believers and non-believers alike. 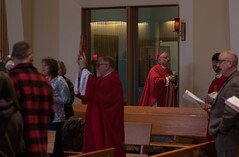 Philadelphia Archbishop Charles Chaput, OFM Cap., recently observed that the most difficult people to evangelize are the ones who think they’ve already been converted. So whether it’s someone at Mass every Sunday, an inactive Catholic or someone for whom religion is not part of life, the New Evangelization invites all people to discover faith anew. It’s about a personal encounter with Jesus Christ. Before a person can share Christ with others, they must first experience Christ in their own life. The New Evangelization is about promoting a personal encounter with Christ for all people, wherever they are in their lives. Whether that means finding faith for the first time or spreading the Good News, the most authentic and effective efforts are the ones closest to Christ. It’s not an isolated moment, but an ongoing practice. Personal conversion and the encounter with Christ is an ongoing experience that lasts a lifetime. Catholics are blessed to encounter their Lord and Savior, Jesus Christ in the Sacraments. Catholics are called to live in a way that reflects the love of Christ. God’s love is shared with our neighbors through caring for the poor and welcoming those who feel distant from God. It’s meant to counter secular culture. G.K. Chesterton wrote that “each generation is converted by the saint who contradicts it most.” The New Evangelization responds to Western society’s ongoing move away from religion by urging Catholics to enthusiastically share Christ in word and through the credible witness of their lives. This is why Pope Benedict encourages Catholics to study the lives of the saints during the Year of Faith and learn from their example. It’s a priority for the Church. Blessed Pope John Paul II made it a major priority of his 26-year pontificate. Continuing this, Pope Benedict launched the Pontifical Council for Promoting New Evangelization in 2010 and made it the theme of the 2012 Synod of Bishops. The U.S. bishops issued a document in April, “Disciples Called to Witness: The New Evangelization,” focused on welcoming inactive Catholics back to the faith. The New Evangelization has an urgency about it, an urgency for all Catholics to embrace the grace of their baptismal call and share the Good News of Jesus Christ with their family, friends and neighbors.